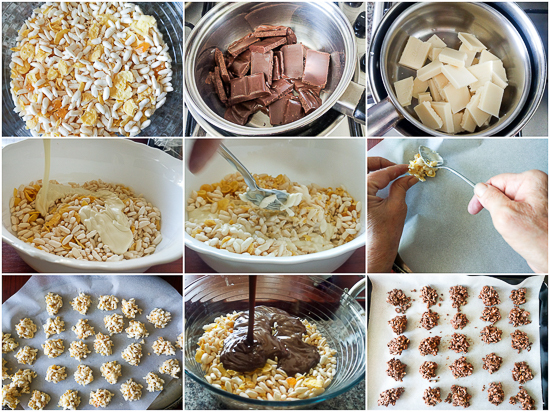 UPDATED: Extra-crunchy puffed rice and cornflake bites congealed with chocolate. I promise, you’ll never look at cereal the same way. I’m usually not a fan of combining many flavors. But recently mom made a few different types of energy-bar like bites. She didn’t advertise them. Instead, she left them hanging out on her counter for a few hours. A wise woman! She knew I’d eventually come snacking. I tried them and loved them. 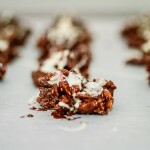 Specifically, I loved these cornflake and puffed rice bites. Rice puffs and crushed caramelized sugar are combined with crushed cornflakes, and then the mass is divided in half. 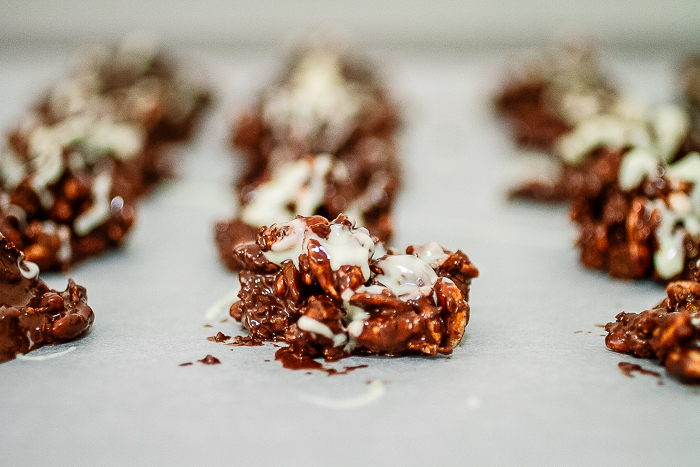 Each half is drenched in a different type of chocolate, mixed until integrated, formed into small bites, and set to stiffen for a few hours. The result are these crunchy, (real) chocolate infused energy-bar inspired bites. I called them puffed rice and cornflake bites, but you can call them whatever you want. I’m warning you though: these are not health bars! They’re a dessert. 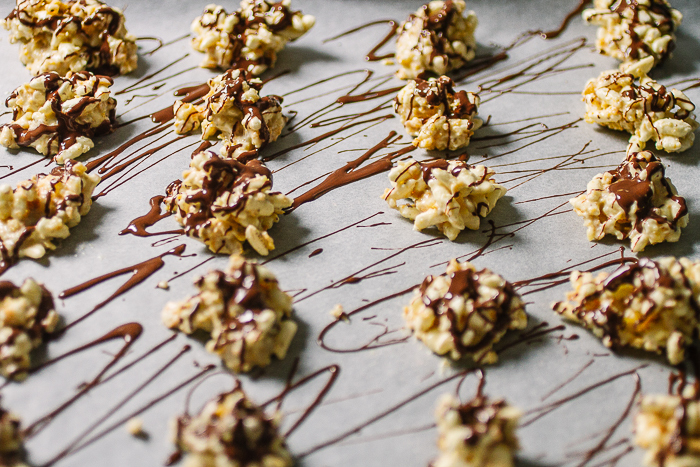 A dessert so crunchy, and melt-in-your-mouth chocolate-y you’ll eat ten before you realize it. You’ve been asking for more videos, and we’ve been obliging. When you get to our recipe index, each recipe that’s been filmed has a “VIDEO” designation next to it. P.S. By the way, Aleksandra and I had the pleasure of meeting Marwah, BLB’s first, and possibly favorite, reader! She was lovelier than we could imagine. 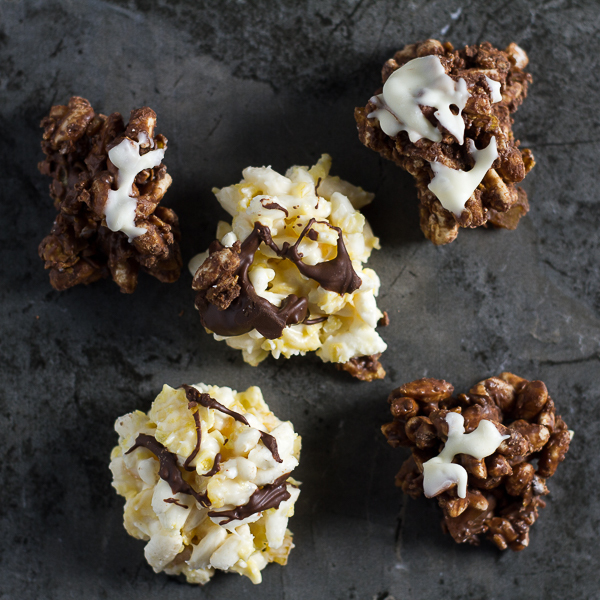 Extra-crunchy puffed rice and cornflake bites congealed with chocolate. I promise, you’ll never look at cereal the same way. In a small pan, heat sugar over medium while stirring continuously. As it starts to melt and darken bring temperature down to low, and stir faster. Once the sugar is completely melted and honey-colored, pour onto a piece of parchment paper and let cool (about 15 minutes). Carefully break sugar into larger pieces. Cover with parchment paper and hammer with a meat tenderizer. Add walnuts and mix. In a large ziplock bag combine sugar and walnuts with cornflakes. Seal the bag pushing the air out. Use a rolling pin to crush the ingredients even more. Add puffed rice, seal and shake the bag until the mixture integrates. Divide the mixture evenly into two medium mixing bowls. Make a bain-marie by filling one large pot 1/2 with water and bringing it to a boil on high. Place a smaller pot (or an unbreakable mixing bowl) inside the larger pot making sure half of the smaller pot is subdued in boiling water. Add white chocolate to the small pot. Stir chocolate while it melts. Once melted, remove small pot and pour chocolate over the crunchy mixture in one bowl leaving 1-2 tablespoons of chocolate aside. Mix ingredients thoroughly. Use a teaspoon to form small balls/ bites. Transfer each onto parchment paper. Repeat steps 5 and 6 for dark chocolate. In total, you will get about 40 pieces/ bites (20 of each color). With a fork use the remaining melted chocolate to decorate the bites of a different color (white on black, and black on white). Leave all bites in a cool place for 4 hours to stiffen. Transfer to a container and keep in a cool location for up to 5 days. *If bain-marie is too complicated you can simply microwave the chocolate until it melts, or melt it over low temperature. Bain-marie prevents burning so it’s preferable, however you do whatever is easier for you. **These are tasty! So, think about making two batches at once! 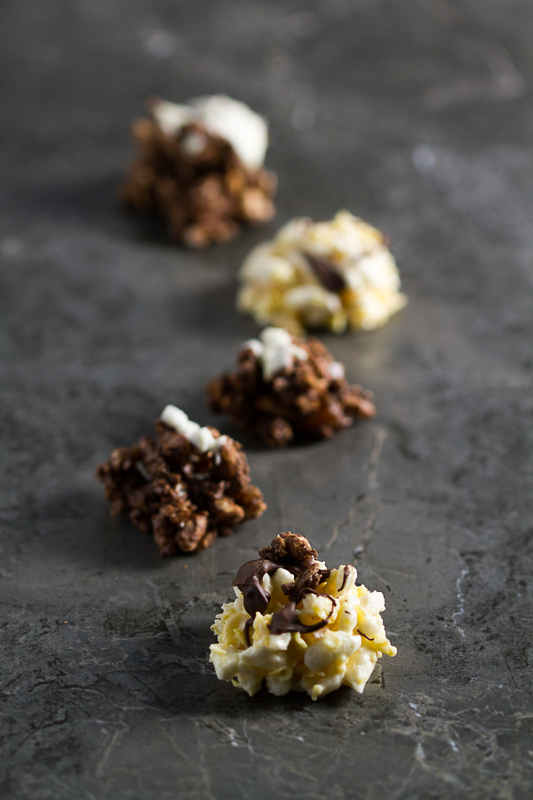 VARIATIONS: Gluten-free: use gluten-free cornflakes, chocolate and puffed rice. Yummy! Awesome about meeting Marwah, your first reader! Super special! 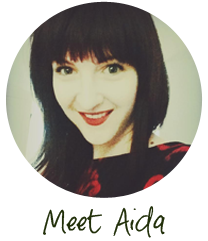 Rest assured you have many more out there who consider BLB their favorite foodie blog. Every time I see a new post I smile and wonder when your restaurant or Blue Apron-like food delivery service is coming! ♥️ to you and BLB! Aw well we love you too Vanja! For now we’ll keep our operations online, but if there is a recipe you’d like to see we’re happy to oblige! Hope you and your boys are having a blast this season! Lots of hugs from Sa!